Moving always takes more out of me than I think it will. It takes more time and more energy than I budget for the experience. Kim — who was fantastic at filling in the gaps during Saturday’s move — then helped me unpack boxes on Sunday. We also took a trip to Ikea to pick up a few pieces of furniture. 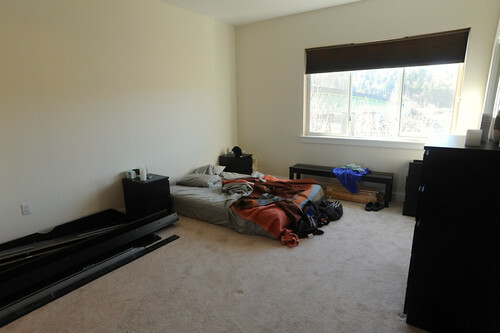 By the end of the weekend, we had a functional kitchen and living room, plus a mattress on the floor of the bedroom. All last week, I worked on the condo. I continued to unpack boxes. Friends helped me pick up odd pieces of furniture here and there. On Tuesday night, my cousin Nick helped me move and install a washer and dryer. Almost. The dryer turned out to be more of a challenge than we’d anticipated. In fact, it’s still not completely functional (though I hope it’ll be usable by the end of today). As Monday turned to Tuesday turned to Wednesday turned to Thursday, I raced to have my place clean and ready for a romantic Valentine’s dinner. Fortunately, Kim’s expectations were low. She wanted something simple, and that’s what she got. I ran out of time to have everything ready, so we ate our steak and salad at the bar. Over the weekend, Kim continued to help me unpack boxes and put together furniture. Now here it is on Monday morning, and I’m still not completely moved in. 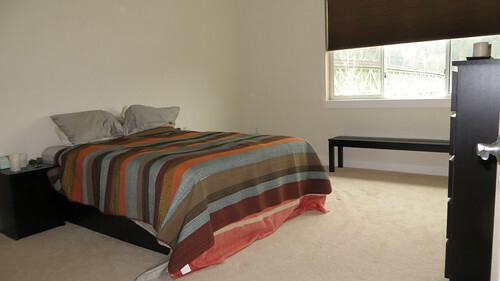 The kitchen, living room, master bedroom, and master bedroom are finished, which is comforting. But the laundry room still doesn’t work (and I’m running out of clean clothes), the office isn’t complete (I need to print some stuff but can’t find my spare toner cartridge), and the back bedroom is filled with boxes of books. Plus, I still have a bunch of stuff at Kris’s place that I need to move. The bedroom in a usable state. Still need to decorate, though. I’m content, though. Even though things are still in disarray, my new condo feels like home. I love the condo itself, and I love the location. I’ve already hosted more people here in one week than I did during a year of living in the apartment. On Friday morning, Kim and I strolled in the sunshine down the multi-use trail that’s right outside my door. We walked to the wildlife sanctuary, then up the hill to the next neighborhood over. We stopped at the grocery store and the hardware store. She stopped to pick up lunch at the Thai place. We talked about our plans for the future. Living here is going to be fun! wow jd! you really have a nice view from the living room there! It sounds like you’ve managed to find yourself living in a walk-able neighborhood. I’m jealous! We live in the country, which is better than suburbia, but we still have to drive everywhere. You should check out James Howard Kunstler’s podcast. He talks about this kind of thing. It’s a great podcast, but unfortunately I now notice the wasteland of strip malls and surface parking more than I ever did before. Anyway, congratulations and I’m sorry if I sort of strayed off topic. Recently I have gotten really good at moving. Since 2009, I have moved 4 times within the US and moved abroad and back for a total of 6 times within 5 years! You would think that I would have gotten used to it by now but I hate it. I plan to stay put as long as possible now. Congratulation JD on your new home, boxes and all. As you are on your way to filling up your space, I must say that less is more, especially furniture and decorative items. Have a vision, make a plan and take your time. Yes, this is from one who had rushed to buy her dining, living & bedroom set in a hurry once she moved into her new home ;) Turned out OK, just could be better. Your rocking chair is simply stupendous, and deserves a post of its own! Congrats, that is beautiful place! I hate moving also. Wishing you all the best in your new place. It looks amazing and I hope you get to stay there and rest your head for a while before life brings more changes. Sounds like you are in a good place now. I can see many wonderful moments there with friends and family. Just went through that moving thing too! In July we moved to our west coast island paradise which I hope is my final move!!! I’ve moved 9 times since I left my hometown, 4 of those moves were international. I used to have movers do all the work thanks to work benefits but now have to do it on my own. My most recent move is the first time in my life I think it may be ‘permanent’, whatever that means or if there is such a thing. Congratulations on your new place, it looks just wonderful. I am a big believer in having something of a view, I think it is good for the soul. I’m now a firm believer in movers! It may not be the *most* financially responsible move, but by the time you factor in renting a truck, all of the physical soreness/exhaustion, the value of your time, and the cost of buying all of your friends food and drinks, it actually works out pretty well. My last move the movers grabbed stuff from my apartment and my boyfriend’s hard-to-get-to apartment and got it all into our new place in 3.5 hours for $520 (including tip) in Seattle. They were done by 11 and I had the rest of the day to make my place livable. Well worth it to me! Sorry I couldn’t come and help move boxes. But I’m so glad you’re enjoying the neighborhood and your place. It really makes my day! Take care of yourself and keep having fun. If there’s one thing that I hate categorically with a passion — it’s moving. BUT, once you get into a great new place you’ve been wanting…it always feels great. Very nice digs by the way, J.D. Congratulations JD! It looks like you are already living up the place. Have fun as you continue to grow and enjoy life. The new place looks awesome! I like the built-ins, the view, and the spaciousness. 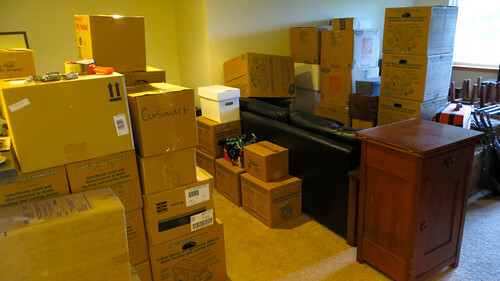 Moving is always tough but there is satisfaction in re-roganizing and re-visitng your stuff. Plus a new neighborhood is always exciting. Your location is great. I would love to live in a walkable neighborhood someday. Right now our jobs are on the West side so where we live is convenient. There’s nothing like moving in to a place and knowing that you made the right choice. Congrats! Congratulations. The condo looks so cozy and awesome. Please put more photos if you can. (Especially outdoor photos of the surroundings would be great). Greetings from Antalya !!! Coming along well there J.D. :-) I hope you will decorate with items from your travels (past and future) … and that you will share more photos as you go. I’m not a fan of condos in general but a walkable neighborhood with water views and wildlife goes a loooooong way! Nice! I hope you love your new place. 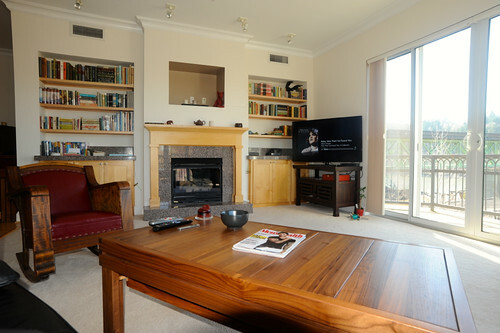 Love the look of the living room. Has some real style to it! 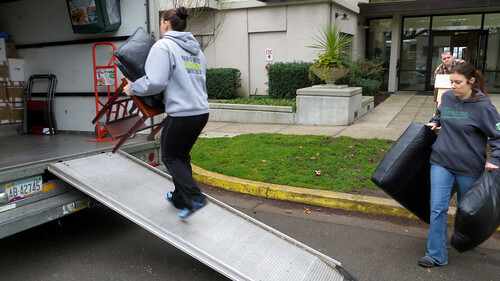 Totally agree with Valerie that hiring movers is a great decision. Definitely worth the cash-ola.